Despite allowing a season-high 27 points, the Buffalo Bills overcame an untimely LeSean McCoy fumble with a forced fumble of their own in the waning moments, to defeat the Tampa Bay Buccaneers, 30-27 on Sunday. The fumble, recovered by rookie CB Tre’Davious White, set up the game-winning 30-yard field goal by Stephen Hauschka, his third of the game. In a game that featured momentum swings and some strong offensive performances from some of the name’s biggest players, the Bills got the last laugh despite 384 passing yards and three touchdowns from Bucs QB Jameis Winston. Pro Bowl RB McCoy scored his first, and second, touchdowns of the season in the contest as he totaled 91 yards on 23 carries against Tampa Bay. Bills QB Tyrod Taylor put forth a solid effort on the ground (6 carries, 53 yards) and through the air, completing 20-of-33 passes for 268 yards and a touchdown. 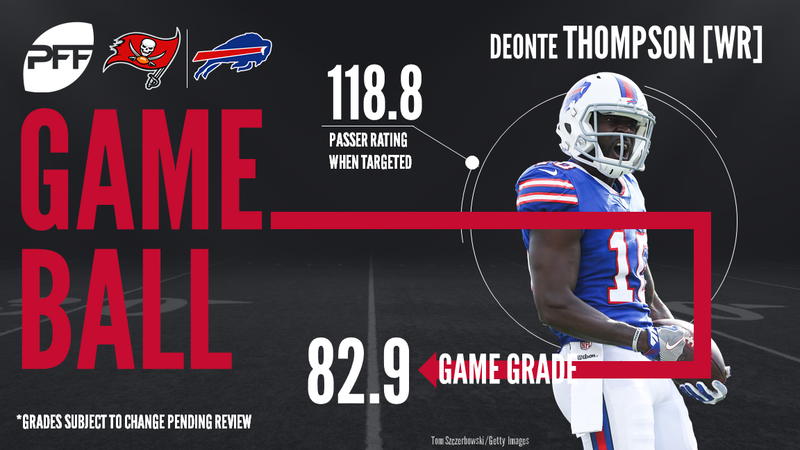 Buffalo may have had an emerging performance from an unlikely wide receiver in Deonte Thompson, who hauled in all four of his targeted passes for 107 yards. , we give you our PFF exclusive takeaways from the contest for each team. Deonte Thompson only played 22 snaps, and while he didn’t play much, he made a big impact, catching all four passess thrown his way for 107 yards. Seemingly, every time the Bills had a big play, Thompson was the one who made it. He ended the day with a ridiculous 7.64 yards per route run, due to 107 yards on just 14 pass routes. The Bills offensive line was able to control the Bucs defensive line with ease for the most part, as they only allowed six total pressures on 38 passing snaps. The best player on the line was Cordy Glenn as he was able to control the pass-rush and also help open holes for the Bills running backs. Milano found himself contributing in a variety of ways against Tampa Bay, all leading to a team-high overall grade. The rookie linebacker tallied two pressures (both hurries) to go with two defensive stops and a very impressive interception on a seam route where he hung with Cameron Brate step for step. Hyde tallied four tackles on the afternoon without missing one, the fifth consecutive week in which he has not missed a tackle (he missed one in Week 1). Hyde also had one pass breakup, his second of the season to go with his league-high four interceptions. Evans hauled in 7-of-10 targets while earning 75 of his 81 yards prior to the catch. He caught two of three passes – including a spectacular touchdown to give the Bucs a short-lived lead deep into the fourth quarter – for 35 yards when matched up against rookie CB Tre’Davious White. QB Jameis Winston had a 127.5 passer rating when targeting his star receiver. Dotson surrendered two pressures (both hurries) on 45 pass blocking snaps in Week 7, just the second time this season he’s been responsible for multiple pressures in a game (he’s surrendered zero pressures in three of six games so far this season). He did not give up a hit or a sack (the lone hit he’s surrendered this season came last week) though, while leading the offensive line with a 79.8 run blocking grade. Lavonte David was all over the field in the run game, recording 12 total tackles and recorded six stops against the run on 29 run snaps. While a good amount of these where unblocked, David was able to shot gaps quickly to meet the Bills running backs quickly. He also forced and recovered the late fumble by LeSean McCoy, that led to the go-ahead touchdown. The Bucs moved Hargreaves to nickel corner, and it made a huge difference, Hargreaves played much more physical and while he only played 36 snaps, he did not allow a single catch on four targets with one pass defense. He was all around the reciever on the other passes that went his way. If he plays at this level, the Bucs will finally get the player they drafted high last season.